Flickering flames: Amy Borsuk writes on a production of Shakespeare’s tragedy that makes artful use of candlelight. 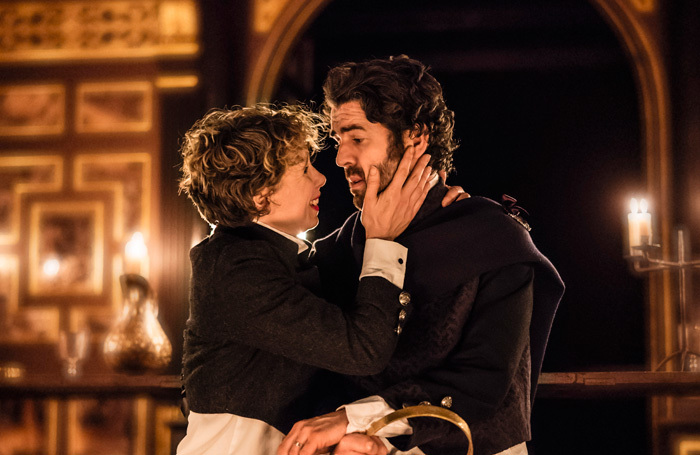 I entered the Sam Wanamaker Playhouse with one major bias already in mind: the fact that director Robert Hastie’s production had employed candle technicians (Cleo Maynard and Peter Carrington). All of my previous experiences in the indoor playhouse had used the venue’s candles for ‘natural’ lighting, rather than as an interesting theatrical device in and of itself. I had already written off the company’s obsession with authentic materials and performance practices, manifest in these candles, as a gimmick. By the interval, I was eating my words. This production of Macbeth is driven by its dramatic use of candlelight, and in many crucial moments, its lack of light entirely. Initially, the audience is lured into a false sense of security. The performance starts with the Wanamaker’s candle-filled chandeliers resting on the stage, only to have a mysterious group of people, all clad in black hoods, black skinny jeans, black boots, come and extinguish most of the light. These people become the three witches and their unseen chorus of whispering voices, casting spells and prophecy into the wind, supported by eerie and beautiful chanting by composer Laura Moody. When Macbeth enters for the first time, he holds a candle-lit torch like a flashlight under a parent’s face at a campfire – perfect for marshmallows and ghost stories. Many scenes are performed with each actor holding their own candle aloft, evoking the dark, rich atmosphere of a Baroque painting. The smell of cedar and smoking candles contribute to the haunting atmosphere in which it seems we, like Macbeth, cannot be sure to trust our senses. Macbeth himself is a conundrum of a character that actor Paul Ready still seems to be figuring out. He is nervous, occasionally stammering his thoughts aloud, already full of guilt. He fiddles with his golden crown, and takes his wife’s advice with the uncertainty of a man who isn’t sure if he is murdering the king because he actually wants the throne or because he feels he is supposed to want it. Meanwhile, Michelle Terry’s Lady Macbeth starts off bold and resolute, casting her own spell with a ritualistic lighting of candles and a command to an unknown force, ‘Unsex me here’. As the story progresses with its domino of murders, the two characters’ personalities switch, as if they have each stepped through a mirror, with Macbeth overly confident, hardened and perhaps traumatized as he lets Burnam Wood come to Dunsinane. This production is full of interesting acting choices for Ready and Terry, but it doesn’t quite land a clear emotional impact. They’re not quite terrifying bloodthirsty, cruel power-hungry rulers, but not quite sympathetic characters caught up in a plan larger than they anticipated, either. The supporting cast’s performances are solid too, with Anna-Maria Nabirye’s performance as Macduff standing out from the rest: her performance of ‘manly’ rage, grief, and revenge are nuanced and compelling. Otherwise, the production utilizes its 50:50 ‘gender-blind’ and ‘race-blind’ casting strategy to bring diversity to the bodies onstage, but not to the reading of the material. It’s all well-done, but not necessarily thought-provoking. The production’s stand-out scene is by far Macbeth’s second visit to the three wyrd sisters. Footsteps patter across the stage without corporeal form. Thumps, giggles and whispers echo from all around, in a haunted house effect that’s enhanced by knocking on the theatre’s back walls. In another classic horror movie trope, the witches take on the voices of children. There is a particularly gorgeous, Caravaggio-esque tableau created as Macbeth creeps in darkness, his candle aloft, towards the stage left gilded door of the theatre. Crouching, like a child looking into the closet, he pushes the door open. He’s illuminated in a golden outline by his candle, but nothing else. This beautifully crafted moment on its own makes attending this production worthwhile. Otherwise, this Macbeth doesn’t do much that’s new with its central players, but it certainly does something interesting, entertaining and entirely spooky in its candles. Macbeth is on at Shakespeare’s Globe until 2nd February 2019. More info and tickets here. Amy is a dramaturg and PhD candidate at Queen Mary University of London. Her research in defining radical Shakespeare performance dips into digital humanities and literary studies, and in part involves teaching a computer to recombine Shakespearean text. As a Los Angeles to London migrant, Amy has happily left her car for the Underground. She has worked at Center Theatre Group in Los Angeles, Dash Arts, and written for Ms Magazine. Cast includes Michelle Terry, Paul Ready, Catrin Aaron, Philip Cumbus, Marc Elliott, Joseph Marcell, Anna-Maria Nabirye, Kirsty Rider, Philippine Velge, and Kit Young.